This was the first time we started a vacation after a weekend. It was nice to relax and pack at a leisurely pace. Kelli and I picked my sister Ann and her two daughters; Amanda and little Samantha in the morning and drove back to our house. My sister-in-law gave all of us a ride to Westchester/ White Plains airport, where we met my mom, my other sister Jeanette, her husband, Anthony and two more nieces, Gabriella and Samantha. AirTrans check-in people were reluctant to get my mom a wheelchair to assist her, and she had to walk to the gate. Fortunately the people at the gate were great and did get her a wheelchair to assist her down the long gateway. My mom is an amputee and we forgot to tell security about the metal rod in her prosthetic leg. The bells went off and they gave her the once over, twice over and on and on. They wanded her leg at least 6 times; so much for leaving from a small airport. I helped my mom onto the plane and the flight attendants were great; seeing her difficulty to walk they let her sit in row 2, business class. There was only one seat available so I sat back with the rest of the family. I was very happy for my mom enjoying a little extra luxury. The flight was on time and smooth, which made my wife Kelli happy. My youngest niece had a couple of great one liners. We told her to chew gum on takeoff so her ears won't "pop". She thought if she didn't chew gum her ears would "pop off" When we were getting ready to land and the flaps on the wings went down she shouted out "the wings broke!" I rented from Enterprise while my brother-in-law rented from another agency. We had little wait at the counter and Enterprise upgraded us free to a large SUV from a full size car when they saw all of our luggage and my mom. Thanks Enterprise! 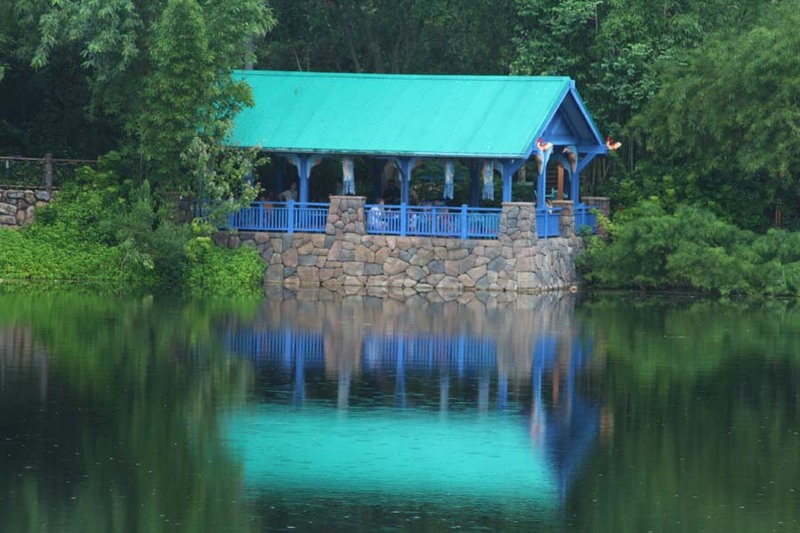 We drove to Summer Bay Resorts on U.S. Highway 192 in Clermont, a bit west of Walt Disney World. The scooter from Scooter Vacations was there in a room off from the check-in lobby and my mom took it for a test drive over to our unit. The grounds were beautiful and pairs of Sandhill Cranes patrolled the lawns and garden areas. We would meet two of these tall birds close-up later on. 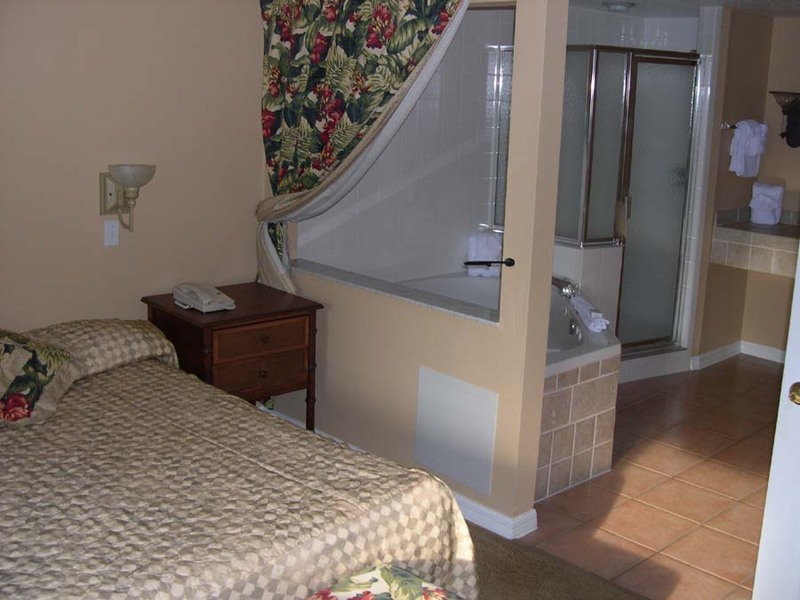 We had two suites, each with a kitchen, large living room, patio, master bedroom with Jacuzzi, another room with two double beds and a pull out sleeper sofa. We had plenty of room. We hit the food stores and Walgreens for supplies and had pizza for dinner; the kids enjoyed the pool and we relaxed. I planned which parks we would hit each day and it paid off with light crowds considering it was summer. The July 4th weekend was also lighter than expected. Most of our waits were 20 minutes and under. 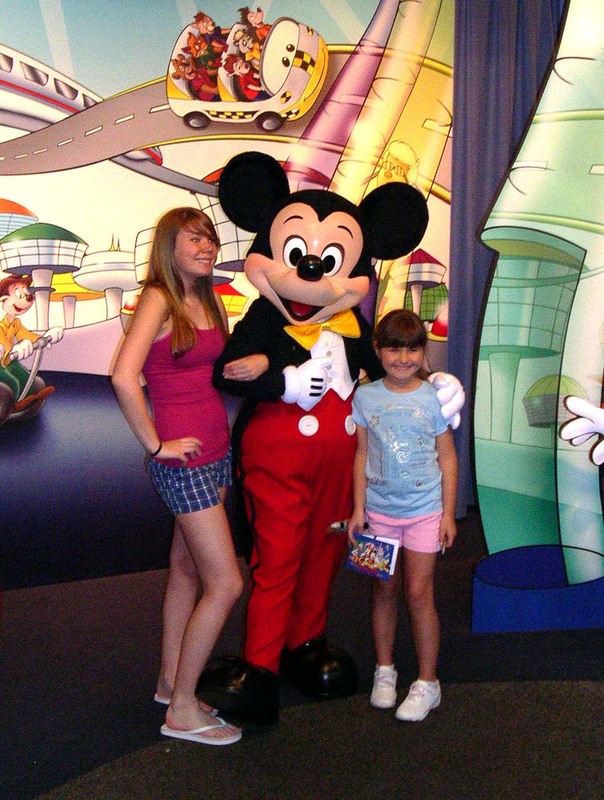 We would hit the parks in the morning that had extra magic hours the night before, reasoning that many on-site guests would take advantage of the hours and either go to a different park the next day or sleep in a bit. We also tended to avoid the parks between 2 and 4 PM. The weather today was cool and cloudy with rain threatening. We headed for Animal Kingdom at 8:30 on the resort bus. We had to call ahead 24hr to make sure the bus would be handicapped accessible. We were a little nervous waiting for it, hoping it would be the right type; if it wasn't our morning would be a disaster. The bus was on time and accommodated the scooter without a problem. 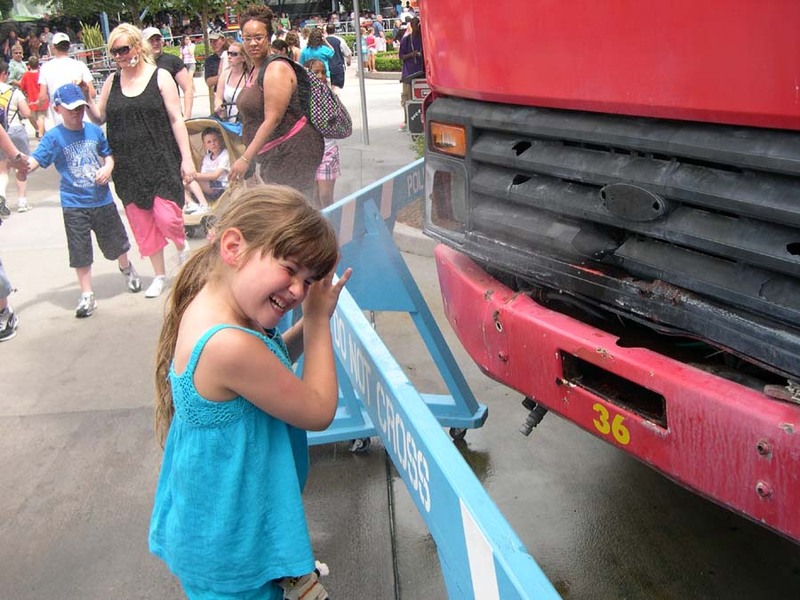 There are only three buses in the morning and three in the evening, so you are stuck at the parks for the day. This is where staying off site is a pain. We arrived at the park just after opening and I ran and got Fast Passes for Everest then met everyone at Kilimanjaro Safaris. The ride was great and all the girls screamed at the rickety bridge. Kelli took some awesome pictures. 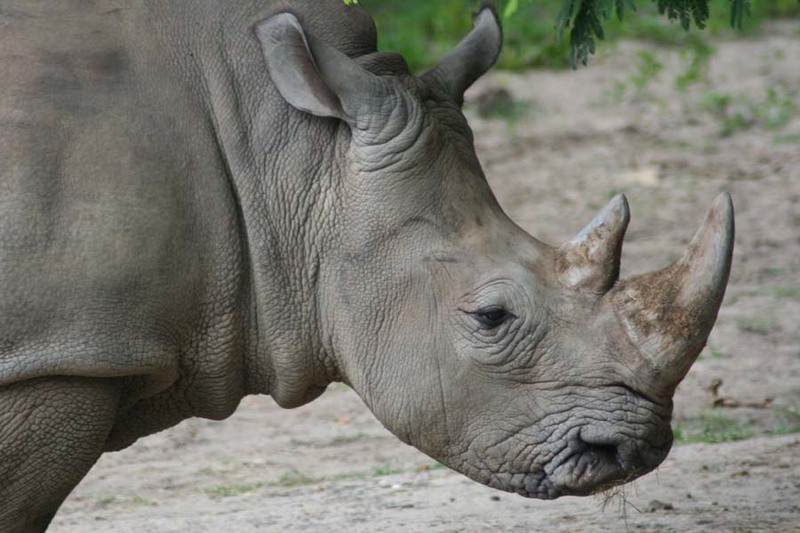 The white rhinos were very close, there was an elephant nursing her baby, and the lions were out. Towards the end the skies grew dark and the wind picked up, then it started to rain heavy, the ominous skies and wicked rain added to the fun and adventure. We put on our ponchos after the ride and walked the Pangani Forest Exploration Trails in the rain. Afterwards, we needed a bathroom break and Ann needed to smoke so we stopped near the Dawa Bar while still in Africa. 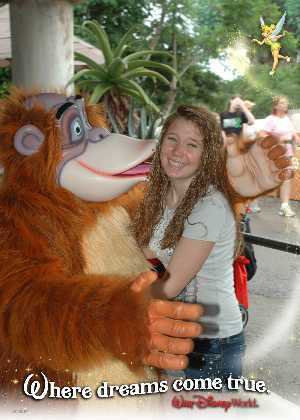 This gave us an opportunity to take our first fast pass pictures with King Louie, the orangutan from the Jungle Book movie. We headed for It's Tough to be a Bug. 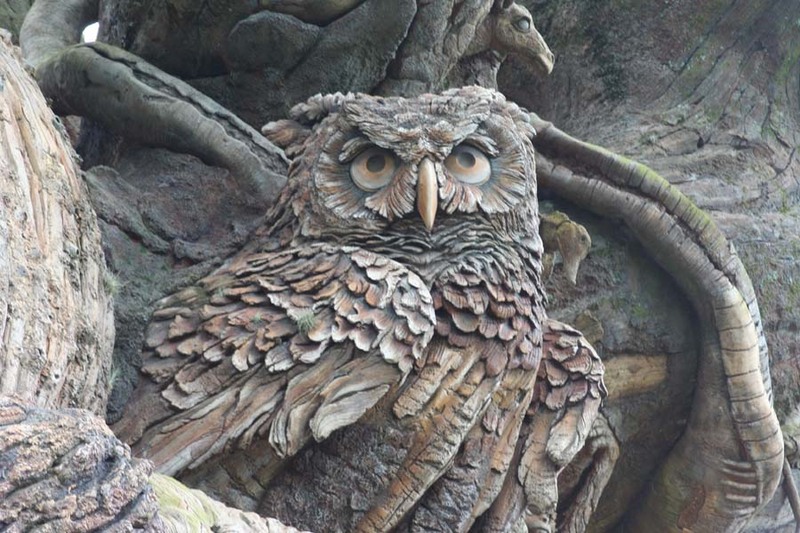 We took our time through the queue and enjoyed the carvings in the Tree of Life. Everyone enjoyed the show, although Anthony did not like the stinger part. 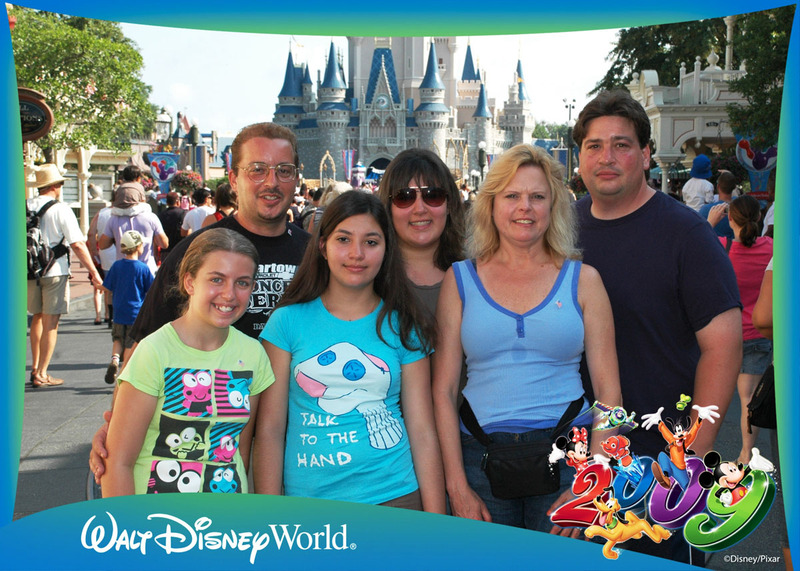 Anthony, Jeanette, my three older nieces and I then did Expedition Everest twice while the others headed for Dinoland. 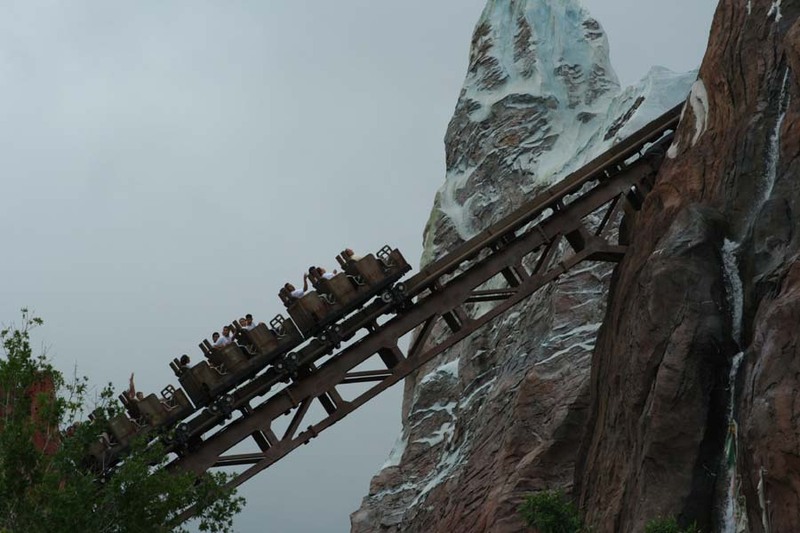 This is the first time I saw the yeti, and on both rides. There was some rain on the second run and it stung a bit during the fast sections of the track. My wife, little niece and sister, Ann rode TriceraTop Spin and won a couple of stuffed animals at the games. 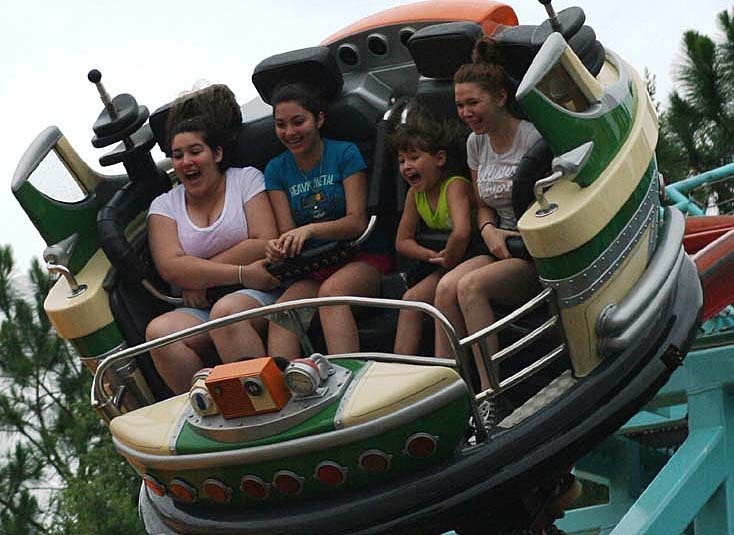 Then all four nieces rode Primeval Whirl. Some were hungry and I took then to the Flame Tree Barbeque. I had the pork sandwich and I found the baked beans were very good. Kelli had the Barbecue Chicken sandwich. Mallard ducks and White Ibises were walking through the seating area looking for handouts and scrapes of food. The rest of the group thought their food was just OK. The rain had started again and we had a long time before the Finding Nemo musical so we got on line for DINOSAUR. The wait was longer then we expected and the ride stopped in the middle and everything went dark. Our ride vehicle was in a part that rocks it back and forth and it would do this occasionally in the dark. Little Samantha became scared and we tried to calm her. It was a few minutes before the lights came back on and the ride started again and we were on our way. We tried for Nemo but it was too late, with the rain it filled to capacity 30 minutes before opening. Since it was raining and we were all partially wet even with the ponchos Kelli and I took the three older girls on Kali River rapids. Kelli and I got the brunt of the water on the drop. There was virtually no wait so we went on twice. Samantha, Gabriella and Amanda were hoping to get wet this time, but the family across from all of us got the wave of water. We met the rest of the group outside. Some got coffee at the Royal Anandapur Tea Company stand. I got an unusual spiced Indian ice tea. I didn't take note so I don't have the name. It was good and different but Kelli didn't care for it. We stood on line for Finding Nemo-The Musical with our coffee and tea in the light rain. Everyone liked the show and my mom loved it as I knew she would. The time for the bus back to the resort was close, 6:30, so we quickly headed out. Back at the resort we ate dinner at the main pool, everything was micro waved, but was edible. I was missing the food courts found on Disney resorts. 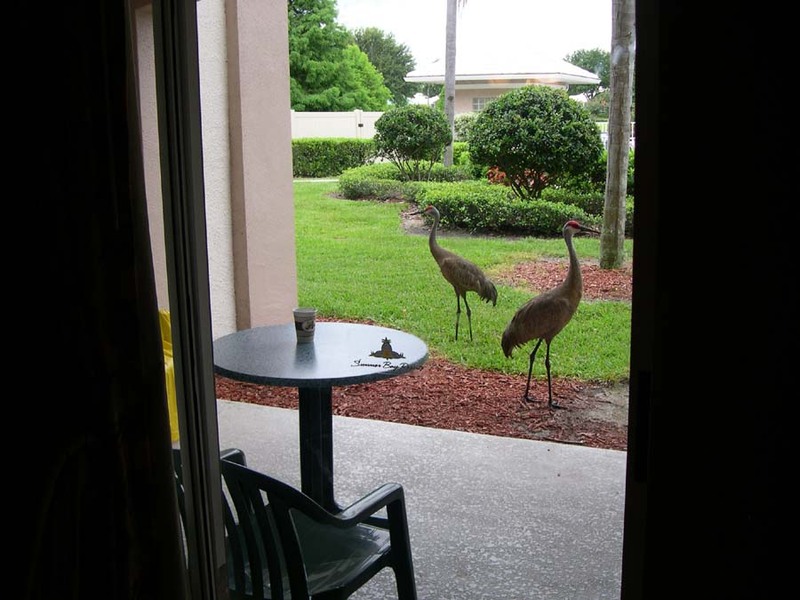 Back at the suites two Sandhill Cranes came onto our patio and we enjoyed their company for the evening. We didn't feel like putting up with the buses so we went by car. Today we headed for Epcot. My mom's scooter was taken apart and we were able to get it in the car. I was worried if it would work after we put it back together, but it ran fine. We arrived just before opening and we all headed straight for Soarin'. My sister Ann is afraid of heights so she requested the back row and got it. The rest of us got row one. Ann didn't care for it but everyone else enjoyed it. We then headed for the Seas Pavilion. Someone offered to take a picture of all of us and we got a nice shot of us in front of the Nemo characters outside. I offered to take pictures for two other groups to repay the favor. We then rode the Seas with Nemo & Friends. We did Turtle talk with Crush next and it was one of the better ones I've seen. Then it was off to Honey I Shrunk the Audience. We headed back to the resort to rest midday. We stopped for cold cuts and made sandwiches for lunch. The kids hit the pool while Kelli relaxed on the patio reading a book while one of the cranes kept her company. We wanted to head back to Epcot in late afternoon for dinner. Jeanette's family was late getting ready so I figured this would be a good opportunity for little Samantha to do the character greet and headed out. The line at the Epcot Character Spot was long and it took 40 minutes but then you get to see Mickey, Minnie, Donald, Pluto and Goofy in quick succession so the wait was worth it. While waiting on line Jeanette's family entered the park and we all decided to split up for dinner so everyone could eat what they wanted. Having children who may or may not try new things, my sisters headed to the American Adventure Pavilion in the World Showcase for familiar foods. Kelli, mom and I headed for the Land Pavilion and ate at Sunshine Seasons. I've heard good things about it on Mouse Planet and we were happy with the selections. My mom had the veggie vegetable soup and said it was one of the best vegetable soups she's ever had. Kelli wanted to try the Roasted Beets and Goat Cheese Salad but could not get it with a different salad dressing. It comes with a Honey Sherry dressing already on it and honey can give her a stomach ache. She settled for the Caesar Salad with Oak-fired Chicken and was happy with it. I went Asian and got the two entrees with two sides option. I had a Spicy Thai Chicken, Mongolian Ginger Beef. Both were good and flavorful but not spicy hot. Desserts were a key lime pie and some type of orange dessert. Both were excellent. After dinner my sister Ann called and said they were at the America Gardens Theatre listening to Slippery When Wet, a Tribute to Bon Jovi band. We headed down when my mom said she felt the scooter riding rough and stopped. I had her come toward me so I could see what the matter was when we heard two loud POP, POP! The right rear tire was almost completely off the rim! With Illuminations not too far away I was worried about getting stuck on the narrow path leading down to the World Showcase with the crowd so I had my mom turn around. 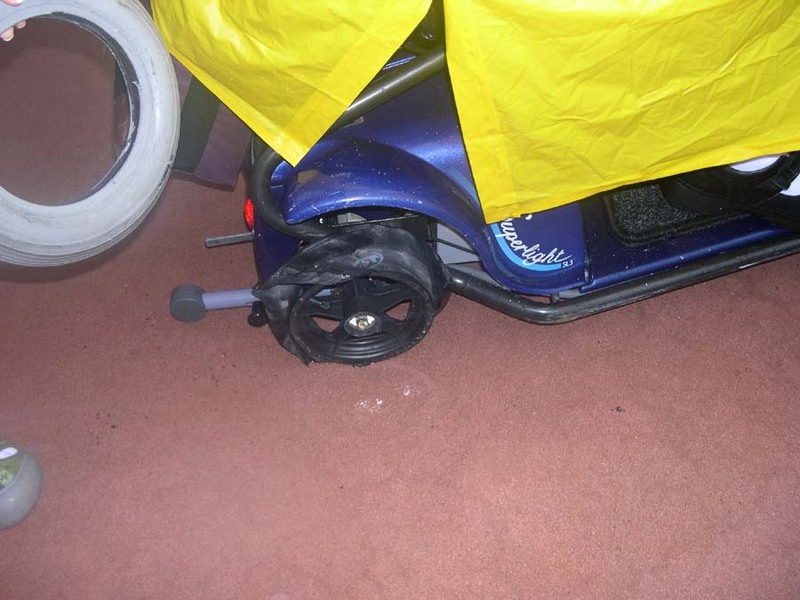 The outer tire quickly came off and the scooter ran on the rim without difficulty. I decided to see if we could make it back to the front to see if the parks scooter rental place could help us. I called my sister to meet us at the front. The rental place could not help us since they have very different models. The car was not far away so we headed back to the resort. I called Scooter Vacations around 9 PM not expecting an answer and figuring the next day would be a lost cause - Not So. A friendly representative answered the phone and was very helpful, and apologetic. 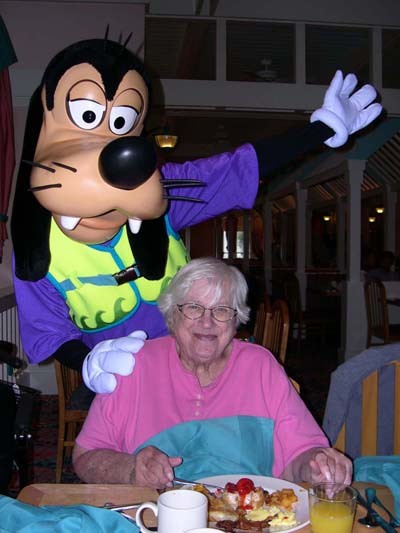 He said that next time call them right away and they will get to you to help no matter where you are in the parks! He asked when we would need a replacement and I said we usually start out by 8 AM. Scooter Vacations had the replacement there by 7:30 AM the next day! Great customer service - I highly recommend renting from them. We took the cars again and arrived at Disney Hollywood Studios before opening and were back in the crowd at rope drop. Since my mom would not be able to get in the ride vehicle at Toy Story Mania, I sent everyone to ride the standby line while my mom and I went and got Fast Passes for Rock 'n' Roller Coaster Starring Aerosmith. We were to meet everyone in front of the Great Movie Ride, but it started to rain so Mom and I headed in. We had the usual Gangster scenario but I still enjoyed the ride noticing new things about each movie scene. When we exited, the rest of the group was watching High School Musical 3: Senior Year - Right Here! Right Now! 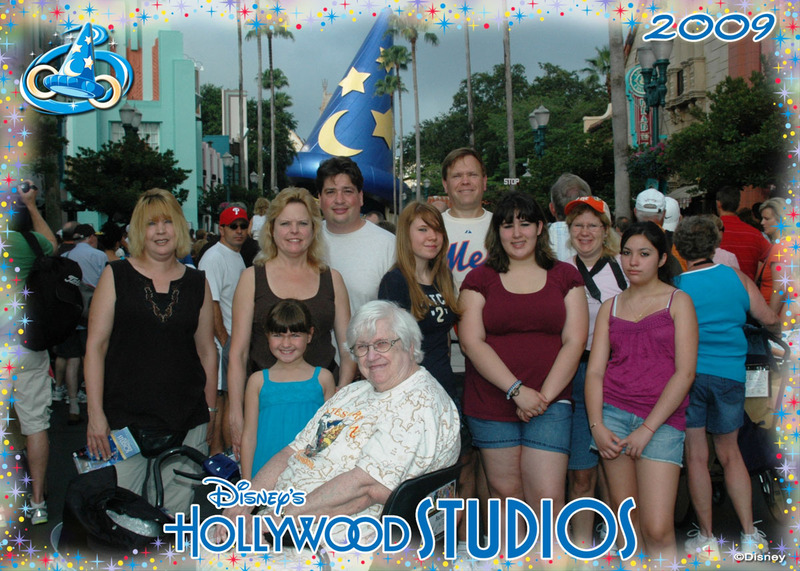 in front of the sorcerer's hat. The older girls wanted to see Journey Into Narnia: Prince Caspian, while some of us wanted Voyage of the Little Mermaid, but Voyage was down for technical difficulties. I lead the whole group to Prince Caspian where there was a wait, so I left the group and got Fast Passes for The Twilight Zone Tower of Terror. We met back up and six, including myself went to Rock 'n' Roller Coaster while the others first shopped then got in line for Beauty & the Beast Live on Stage. After the coaster Jeanette and Anthony took a walk and I took the three older girls onto the Tower of Terror. They were a bit nervous, but afterwards wanted to ride again, but the beast had just let out and all ten of us reconvened on the street in front of the show. The next plan was to split up again; the thrillers would do Star Tours and the rest Voyage of the Little Mermaid. Little Samantha didn't want to sit through another show so, she and my sister went to Honey I Shrunk the Kids Playground, leaving Kelli with my mom for Voyage and the rest of us for Star Tours. This is where plans kept changing in our group. The wait was moderate, only 30 minutes, but my group decided to Fast Pass it. Now we had time to kill so they wanted to do lunch. While standing on line to order food, Anthony sees that "Indiana Jones Epic Stunt Spectacular!" will be starting soon so off we went. I was annoyed that Ann, Samantha, Kelli and mom were left out of our ever changing plans. The show was filled so we only had standing room in the back. Then my group thought that we should leave, I said No! Let's stop changing the plan so we can inform the others. Right now Ann would be stuck at the playground for one and a half hours before we would get her, and who knows what my mom and Kelli would do. I called Kelli but could not get through. I called Ann and told her what were doing. She ended up leaving the playground and just waited outside Indiana Jones for us. Fortunately, Kelli and my mom had to wait two shows before getting in. Kelli called Ann and they met up and all four waited for us. Kelli had a tough time helping my mom with the scooter, especially when you had to back up into a small viewing spot inside the theater. She wanted me to include these notes of advice. . . If you're part of a group and want to do a show-but time restraints won't allow it…..perhaps think about attending alone and meeting with the group later. 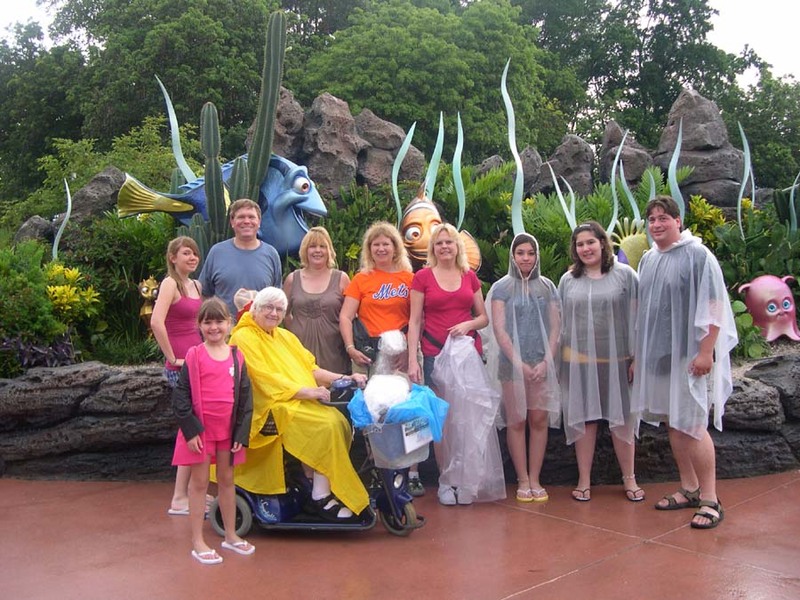 Also…..even on a sunny day-you won't look funny wearing a rain poncho on the Kali Rapids-some people might think "what a great idea". Finally back together we had lunch at the nearby Backlot Express. My niece Amanda notices her old Volleyball Coach on line! She hadn't seen him in over a year. It always amazes me how people can run into each other so far away. …It's a Small World After All …At the end of lunch, my sister Ann, Amanda, and little Samantha visited with his family and saw their new one year old baby. After lunch we split up again, but this time I went with Kelli, Ann, little Samantha and my mom. The other five went to do Star Tours and go on Tower of Terror again. We did Muppet*Vision 3D and headed back towards the Studios Backlot Tour. On the way we came across the "Singing in the Rain" umbrella. 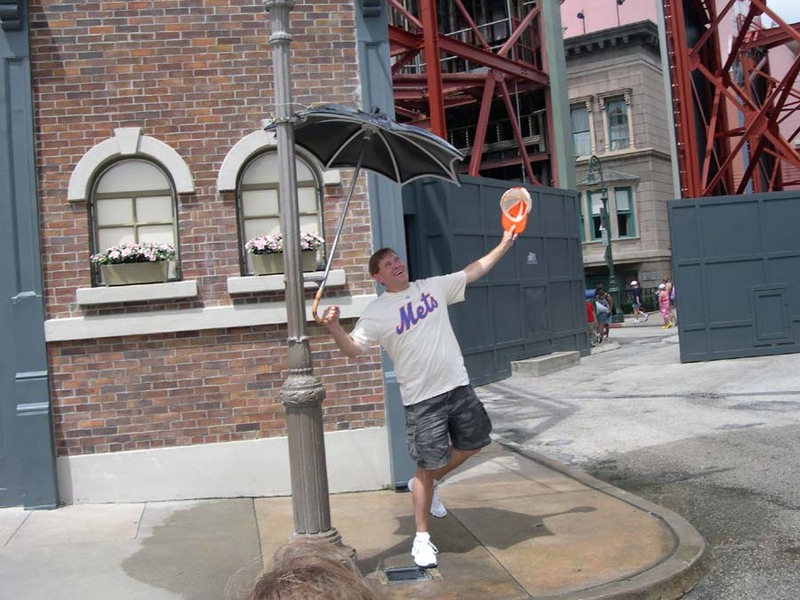 It's on a corner and when you hold the umbrella and stand on the light activated spot, its starts raining. I posed for a couple of photos then let the kids play with it. The Backlot Tour wait was 40 minute so we passed. Samantha found the water mister coming out of the "wrecked" truck and got an unexpected very wet face. We decided to head out; we ran across the Block Party Bash and watched for a while. We thought about getting to the next American Idol Experience, but figured it would be too long of a wait. We were disappointed about missing it but as you all know, you can't do everything. We'll look forward to it the next time down here. We later met up with everyone at the resort and could not agree on what or where to eat. A few went to TGIF's, Ann and little Samantha stayed home and Kelli, mom and I tried the Denny's nearby; we were hoping for some simple decent food and were happy with our meals. We checked out of Summer Bay Resorts and left by 10 AM. 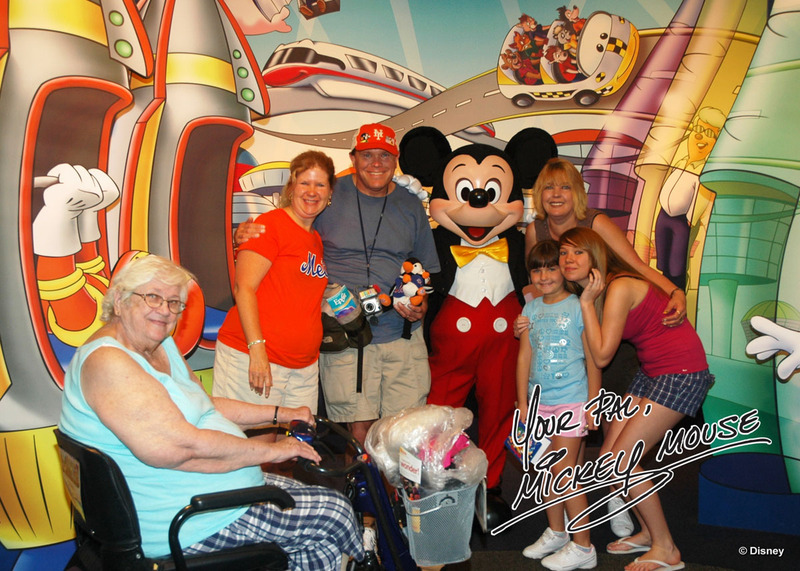 My sister Ann, her two kids, my mom, Kelli and I checked in at the Pop Century Resort. 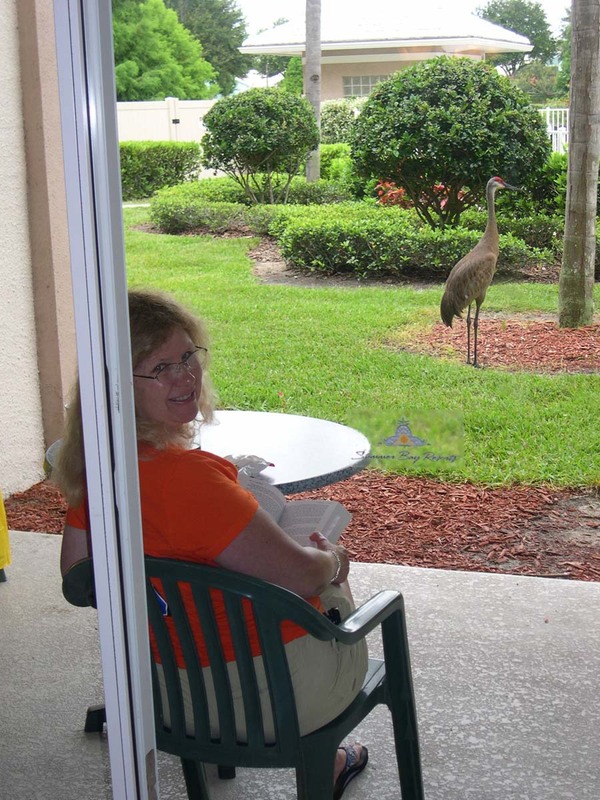 My sister Jeanette and family continued to stay off-site but at a different place. Their resort had a lazy river on site. We picked up mom's new rental scooter from Pop Century's luggage check in area. The model was a Revo from Buena Vista Scooter Rentals. The speed control was excellent. It was a dial and you can set it for extremely slow for maneuvering in confined spaces. We headed straight to Downtown Disney by bus. In 2006 my mom was unable to visit Downtown since we went in the evening when it was crowded and trying to get a scooter through the stores would have been a nightmare. 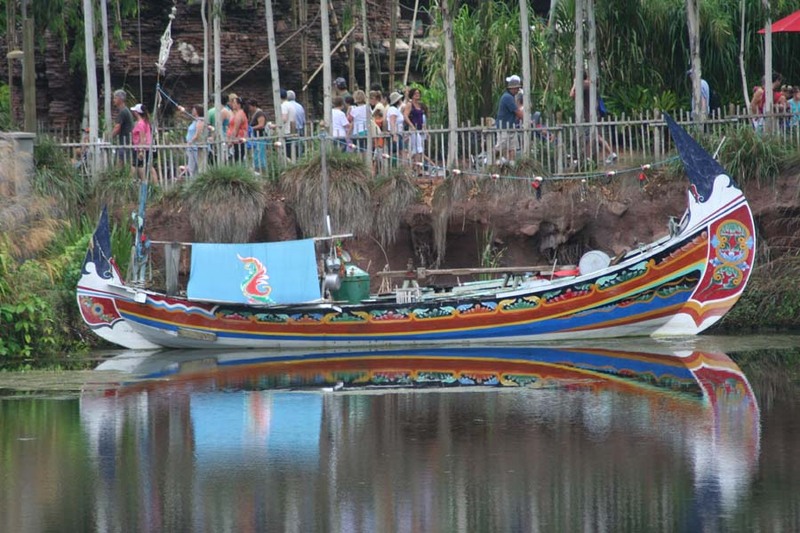 But late morning the area is uncrowded and we were meeting Jeanette's family to eat at the Rain Forrest Café. We looked through the Days of Christmas store and we each brought a few ornaments. Lunch at the Café was good and we were seated right away. Some of us went to the Hanes make your own T-shirt place. It's located right across from Days of Christmas next to the fountain play area and near the Disney Buses. I was expecting it to very expensive, it's not cheap, around $25 plus tax, but you get a quality- one of a kind T-shirt. First you make a selection of what type of shirt; short or long sleeve, children, regular or women's etc. Next you select the size and color. I noticed that there are some different color selections for the regular T's vs. the Lady's fitted T's. Next you choose the main graphic, you can only choose one. There is a good selection. They are broken up into categories with numerous examples in each. Some were The Fab Five, Princesses, Disney Movies, and other Disney Characters (including Chip and Dale, many of us wish there were more Chip and Dale merchandise in the regular stores!). Then you have four lines of text. One is above the graphic and can be straight or curved (like a rainbow). The 2nd, 3rd and 4th lines are below the graphic. The 2nd line can be straight or curved (like a smile). 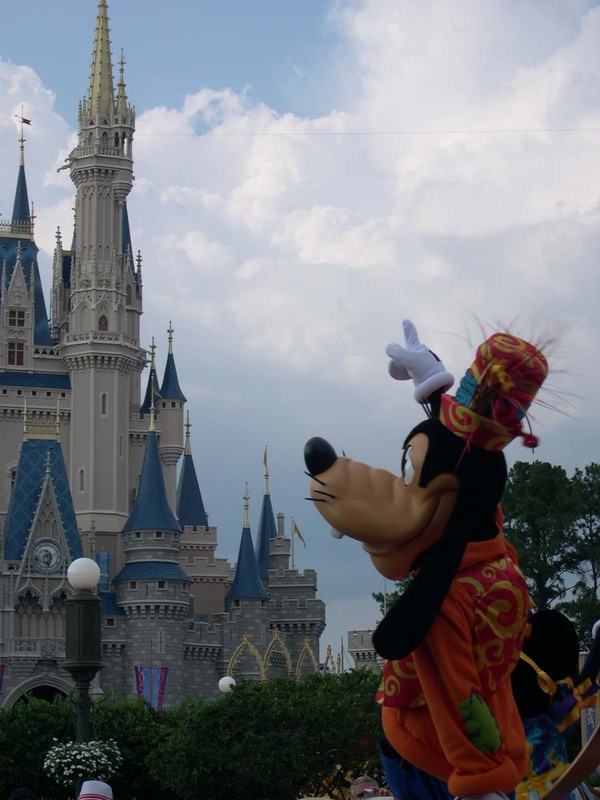 As for the text you can type in your own text or select some stylized common phases such as; "Happy Birthday", "where dreams come true", "Walt Disney World", "2009" etc… You don't have to use all lines. 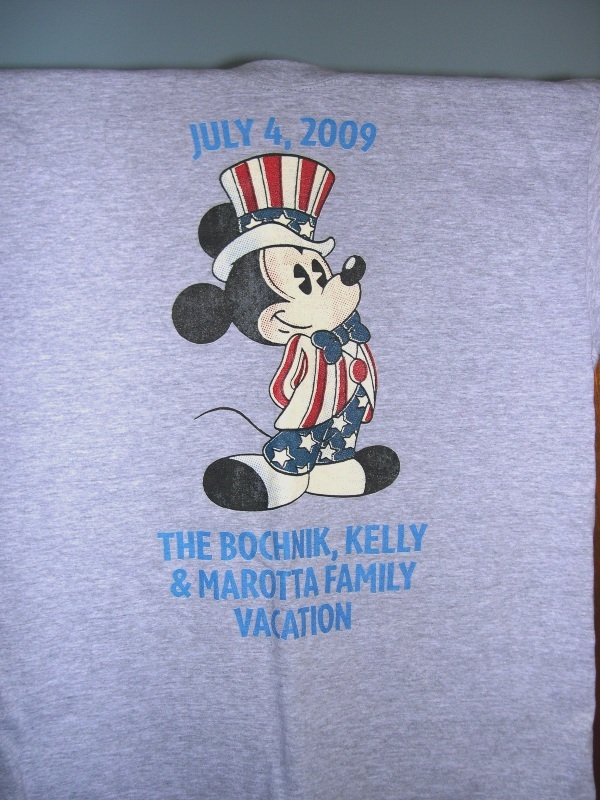 I wanted one for the 4th of July so I chose a Mickey with a US flag design, on top it said July 4, 2009 then below it had our family names followed by Family Vacation. I made a similar one for my mom. 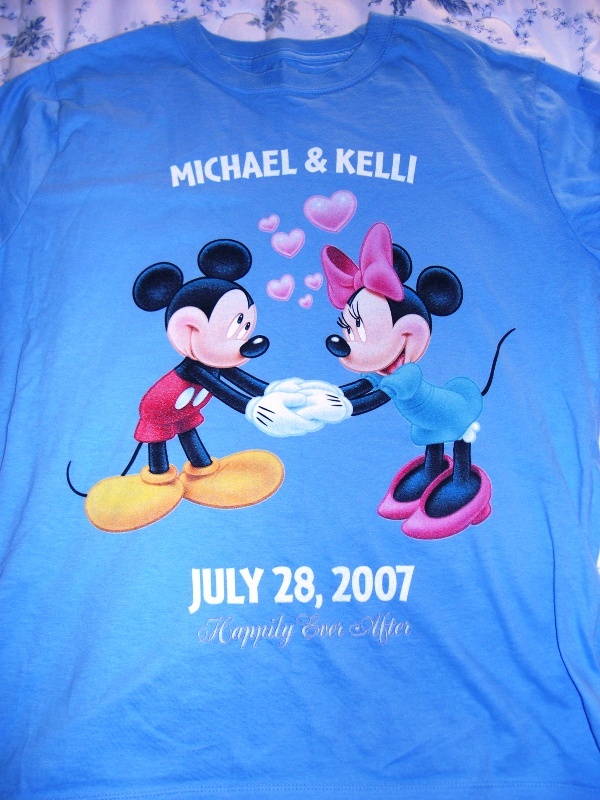 Kelli chose Mickey and Minnie holding hands with hearts all around, our names on top and wedding date and happily ever after below. Once you pay for your shirts you can pick them up in one or two hours. We then shopped in the Pooh Corner store, TrenD, Team Mickey Athletic Club, World of Disney and played with the legos at the Lego store. 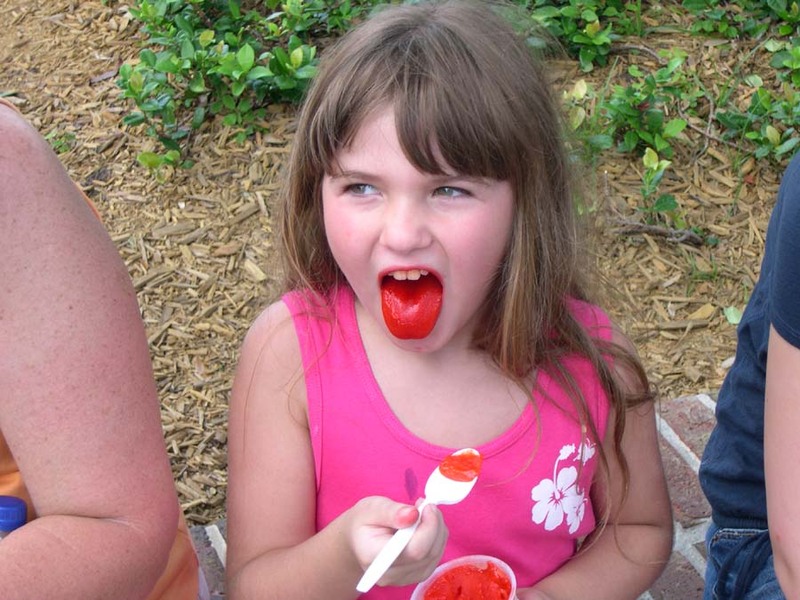 We stopped for ices which made Samantha's tongue bright red from her cherry flavored ice. My nieces rode the small train ride, and then played in the water play area outside the T-shirt shop while we picked up our purchases. Back at the resort we were surprised that we were chosen Mousekeeping family of the day and received turndown service, a certificate and a magnetic photo frame. That evening we let the kids play in the arcade at the resort. This was the first time I've been in there and I played with little Samantha. She was surprisingly good at the NASCAR driving game, despite that she could barely reach the accelerator. She was able to keep it on the track for the most part. We also played air hockey and won a lot of tickets on a variety of games. This is a fun place! 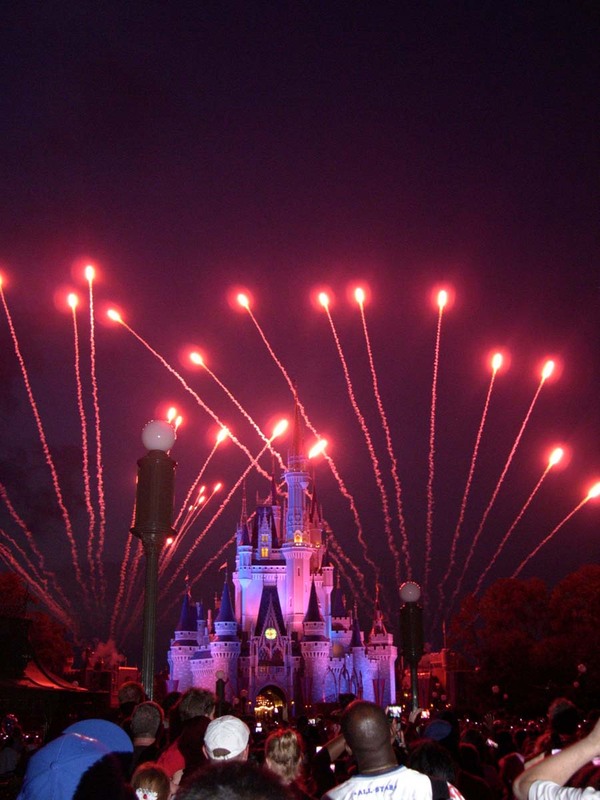 We slept in a bit since we planned for a long day ending with the fireworks at the Magic Kingdom. My other sister was already in the park so we headed out at 10AM. 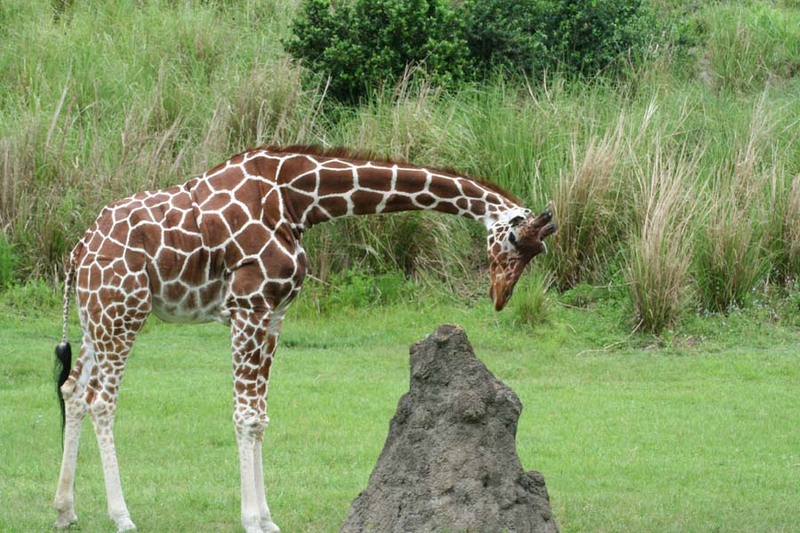 I was surprised that the park was not mobbed. In fact, it was kind of light. 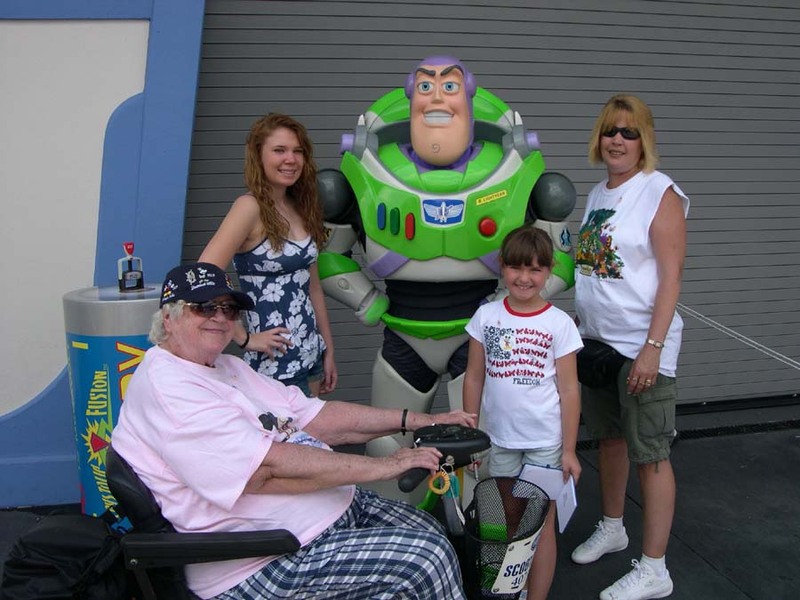 We grabbed Fast passes for Buzz Lightyear's Space Ranger Spin then saw the Monsters, Inc. Laugh Floor. This show gets better every time. The people highlighted were hilarious! The wait for Buzz was only 20 minutes and we didn't bother with the fast passes. Kelli had the high score followed by Amanda, then me. Next was Walt Disney's Carousel of Progress which I feared would bore the two girls - but they enjoyed it! Buzz was outside so we stood on line to get his autograph and pictures with him. Kelli and I grabbed lunch at Cosmic Rays while the other got smoothies at Auntie Gravity's Galactic Goodies, then we all shopped in the store next door. We took the quiet back path behind Tomorrowland Speedway to Toontown; this was a nice relaxing walk away from all the people and noise. From the path we had great views of the WDW Railroad. Amanda took her sister Samantha onto the Barnstormer at Goofy's Wiseacre Farm. It was a 40 minute wait for the roller coaster for a one minute ride. We got a call from the other party, they were working the opposite side of the kingdom and they had two extra Fast Passes for Splash Mountain. Amanda and I headed over. The wait was longer than normal since the ride was down for some time and there were a lot of fast passers on line. It's been a while since I've been on and everyone really enjoyed it. Meanwhile Kelli, mom, Ann and Samantha did It's a Small World (I heard later my sister Ann had some trouble wheeling my mom onto the boat in a wheelchair and almost dumped her in!) Afterwards they did Cinderella's Golden Carousel and my wife Kelli counted how many times it went around -- 3 revolutions! I guess any longer would make the wait unbearable. We met back up and found out that Ann had to help the scooter go up a hill. I looked at it with it on but not moving and the battery read in the green so I thought it was OK. I had my one and only Mickey ice cream bar and Samantha and Kelli had ice pops. We headed for Mickey's PhilharMagic and the scooter would only go slowly. When you turned it on the battery indicator was in the green, but when you pressed the accelerator it would drop into the red zone. I had to push the scooter to assist it. We went into Mickey's PhilharMagic and we had a Disney Cast Member (CM) melt down. We went through the queue and then a CM put us through onto the fast pass lane due to the scooter but never told us which doors to go through for the handicap seating. There was no CM in the holding area to ask. The doors open and we went in. Again - not a CM around and we went in the wrong doors for the scooter. By the time we realized the mistake - all the regular people had taken all the handicap seating. To make matters worse they over filled the auditorium. We, as well as fifteen other people were left to the side of the room with no seats and no place to go. Then to top it off a CM finally appears and yells at us for being there! What an idiot. We scolded him for his stupidity, lack of CM's to direct us and for overfilling the room. He gets mad and leaves us all stranded there. We watched, standing on the side, the screen was dark and the colors washed out from this view. When it was over and the lights came back on - No CMs anywhere, they just opened the exit and entrance doors at the same time. I'm guessing the CM we talked to realized the mistakes made and hightailed it out of there! Now we are trying to go against the flow of the big crowd coming in and trying to get to the back top of the theater to where the scooter and wheelchair seating is located. By the time we got there all the seats were taken. I was able to get my mom into one of the empty wheelchair spaces but Kelli and I were left to stand at the back at the room. We had to stand again but at least this time the movie looked better. When we got out of that mess, the scooter wasn't going anywhere. I called the company, Buena Vista Scooter Rentals and I told them of the problem. Their representative stated that the Revo only holds a charge for 6 to ten hours (ours was going after 5). He offered no help, no replacement, nothing. He said we should have taken the charger with us. We were stuck with what we had. Fearing we would get stuck in the park we headed out. We had to leave and miss the fire works and the rest of the day at the Kingdom. My mom was very disappointed. I pushed the scooter back to the front of the park. We had one bright spot. I needed to rest and the Move It! Shake It! Celebrate It! Street Party was coming up Main Street USA. We stopped at the hub and had a great view of it. It was high energy, colorful and full of characters. Many of the characters dance in the street and Ann and Samantha joined them. We made it back to the bus stop and to the room, with me pushing the scooter all the way. I put the charger on and asked if anybody wanted to try to go back and try for the fireworks. Only Kelli and I wanted to try so off we went. 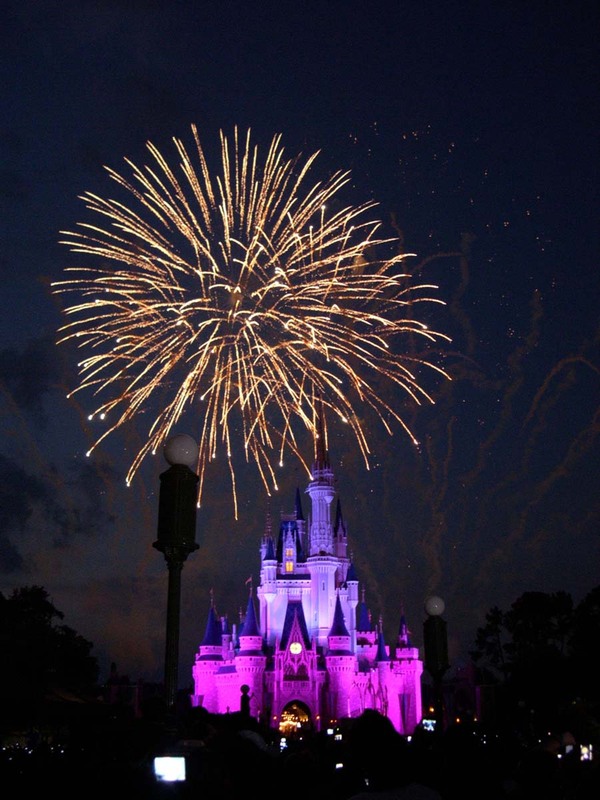 I vowed to get my mom to see fireworks the next two nights for Illuminations and Wishes. Since it was only the two of us we made quick time. If we were a big group we would have needed to find a spot right away, but for two we figured we could eat first. We went to Columbia Harbour House and after we got our food we ate upstairs where it was nice and quiet. With a little less than an hour to go we went back to the hub. It was filled! We followed the moving crowd slowly towards Main Street, I was worried we would not find any spot and end up at the exit! But a small spot on the bridge before Main Street was just big enough for the two of us so we grabbed it and the wait began. The 4th of July Fireworks were very nice, lots of patriotic music and about 15 minutes long, but we didn't see any new type of fireworks and I was expecting more explosions. I think the Halloween Party fireworks last September were better. It may be due to the budget cuts, or being from NY and having the Macy's Fireworks, maybe I was expecting too much. But we still enjoyed them. We had reservations at 7:40 AM for Goofy's Beach Club Breakfast. My sister Jeanette opted out so the six of us drove over to the Beach Club. The Beach Club is real nice but doesn't feel like Disney like Pop Century does. Don't get me wrong I'd stay here in a heartbeat if I could afford it. We left the car at the Beach Club and took the path to the international entrance. Epcot had extra morning hours but we didn't get there till 8:45. 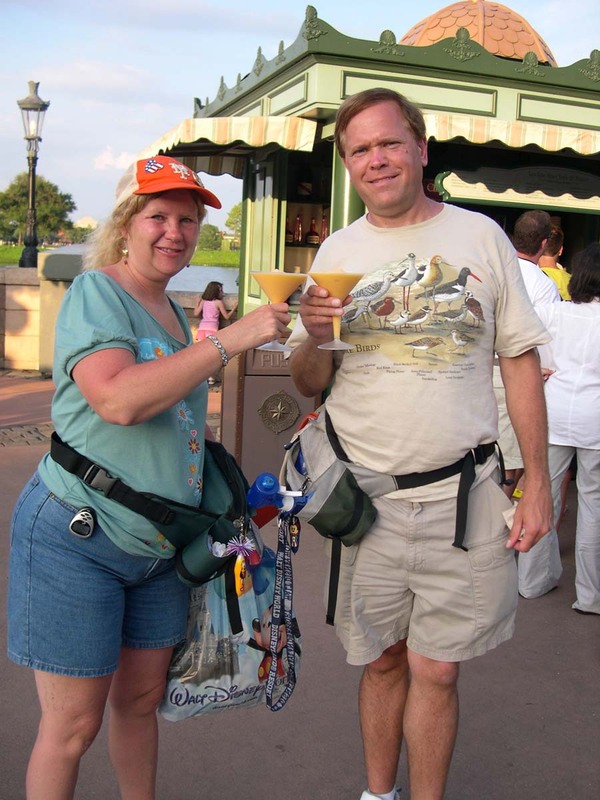 Ann's husband, Scott, had called her and mentioned a monorail accident but we didn't know any of the details. I didn't notice that it wasn't running till much later. It was empty in the park all morning long. 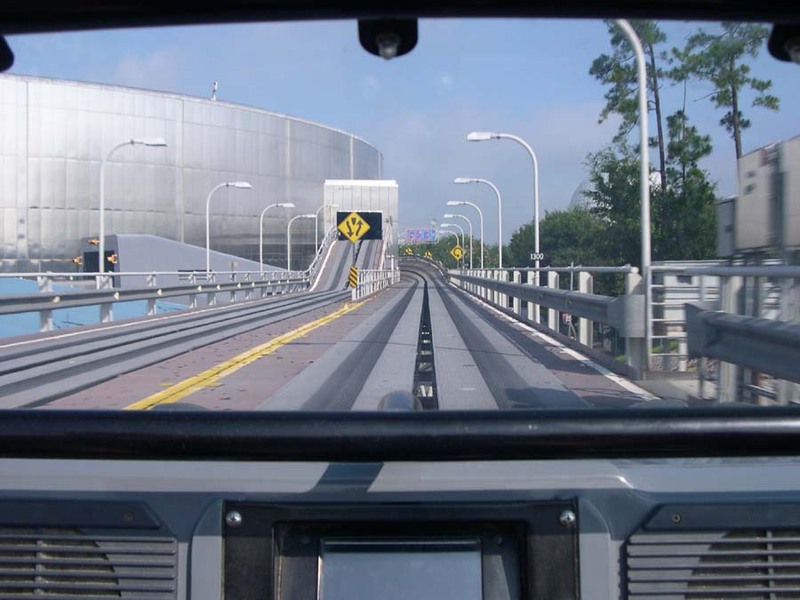 We did Test Track first. I was happy to hear little Samantha laughing in back of me during the outside part. I then took Amanda onto Mission: Space while the other hit the rest rooms then Mouse Gears. She was a little apprehensive so we tried the low intense, green side. The wait was shorter and it gave me an opportunity to see this version. You still get a great experience (minus the G-forces). I can now recommend this to people who might be afraid of it or think that the green side would be too lame, it wasn't. I would still caution those who have some claustrophobia. We made our way to Mouse Gears and I noticed a Purple Martin House with a few birds just outside. These bird are cavity nesters but do it apartment or condo style. The houses are all attached and next to each other. 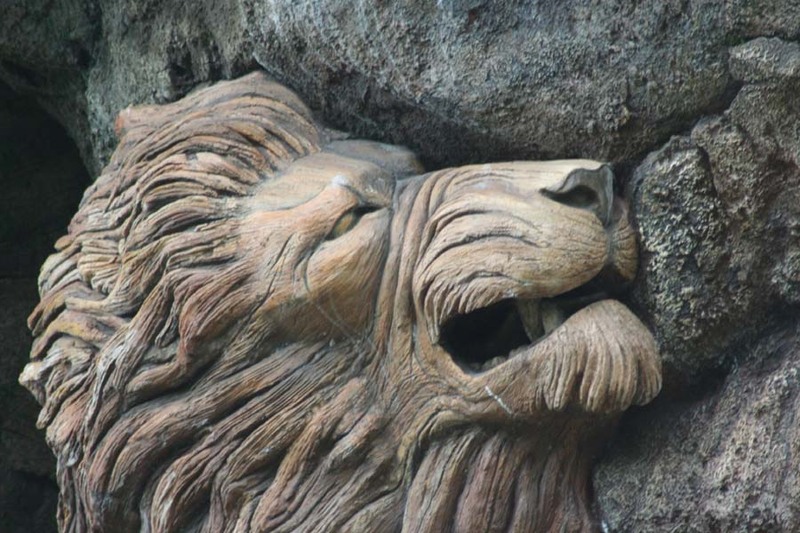 I never noticed it in Epcot before and it was a delight to see. After shopping we went back to rest and play in the pool. It was a hot and humid day and we wanted to have enough energy for the evening. I was determined to get mom to the countries. We took the bus back since our car was at the beach Club. Later we could leave by the international exit after illuminations. We arrived at 4 PM and did Spaceship Earth. Everyone was thrilled by the videos of themselves at the end. We sent the e-mail videos to friends in the Siemens AG's interactive play space and watched Amanda and Samantha play the body parts 3D game. We headed for the China Pavilion and saw the end of acrobats; they performed indoors due to the heat and humidity. We saw the Wonders of China movie and moved on to Germany. At a kiosk featuring glass I found a small shot glass size glass boot, like the boot in the "Beerfest" movie and it had Mickey on it. I had to get it for my collection. Ann wanted to shop in the Mitsukoshi Department Store and luckily the Candy Lady had just started. It was amazing how fast and she could turn a lump of candy into anything someone called out. Samantha was a little disappointed that she wasn't picked, but she perked up when she saw all the interesting items in the store. Kelli and I grabbed some food in Mexico and we all headed to the area for handicap viewing. Only three guests can accompany my mom so Kelli and I stayed just outside the area. It wasn't a problem since the crowd was so light. Illuminations wowed everybody and we made our way to the international exit. The Revo scooter gave out once again and I had to push it. Some of those hills made it tough. It was nice to have the car at the Beach Club and avoid the buses. The Magic Kingdom had extra magic hours the night before so I knew it would be empty in the morning. We had a late night so my mom and Amanda slept in. This gave us an opportunity to quickly hit all the rides for little Samantha at Magic Kingdom. We were there before opening and had a great view of the opening festivities. We quickly headed for The Manny Adventures of Winnie the Pooh, we were second on the ride, and we then literally walked onto Snow Whites Scary Adventure and Peter Pan's Flight. We did the Haunted Mansion next. There was a small line that moved quickly. We stopped just outside the doors and I was able to point out how the Leota grave stone opens and closes her eyes. Everyone else in line got to see it too. I think many people miss this if they don't see someone else pointing it out. I got some video of Leota as well. We went to the Tiki room but it didn't open for 15 minutes so we went on the Jungle Cruise. The cruise had no wait; well we had to wait till the boat filled up. We had a good captain. We then did the Enchanted Tiki Room -Under New Management. Next was Pirates of the Caribbean, then Country Bear Jamboree. I then picked up some fast passes for Big Thunder Mountain Railroad to hopefully use later in the evening. Then I was surprised to hear that little Samantha wanted to try this roller coaster. This would be her first time on larger roller coaster and I was sure she wouldn't want to ride when she saw it. We went to the path leading up and behind it (the exit for the ride). 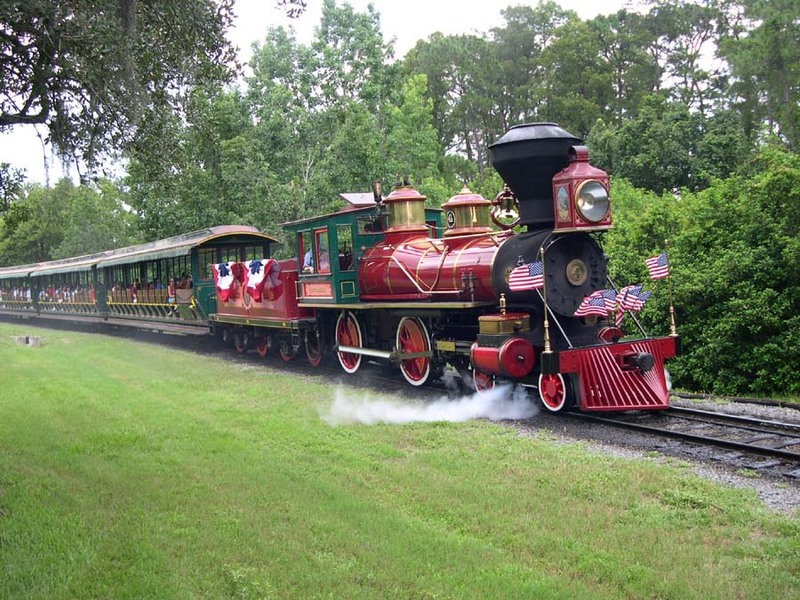 She saw that it was a train and she didn't see any big drop so said she was Ok with it. So Ann and Kelli stayed behind and on we went. I was nervous taking her on. What do I do of she freaks out? I hadn't been on this coaster for a while, I knew it wasn't intense. I remember taking photos while riding it. Well - she enjoyed it, what a relief! We wanted to see the new Hall of Presidents. We timed it perfectly and went right in. I heard rumors that after all the cat calls that Clinton received and the boos W Bush got; that the next president would not give the ending speech and that George Washington would do it. Well, after all the presidents were introduced. Obama said his oath of office and then George talked, but then Obama did give a good closing speech. Very well done. We did 10 attractions in a little over 4 hours. We headed back and spent the afternoon packing. Kelli and I were beat but she still wanted to see the Electric Parade and I wanted my mom to see Wishes. Only Kelli, my mom and I headed out for our last evening. 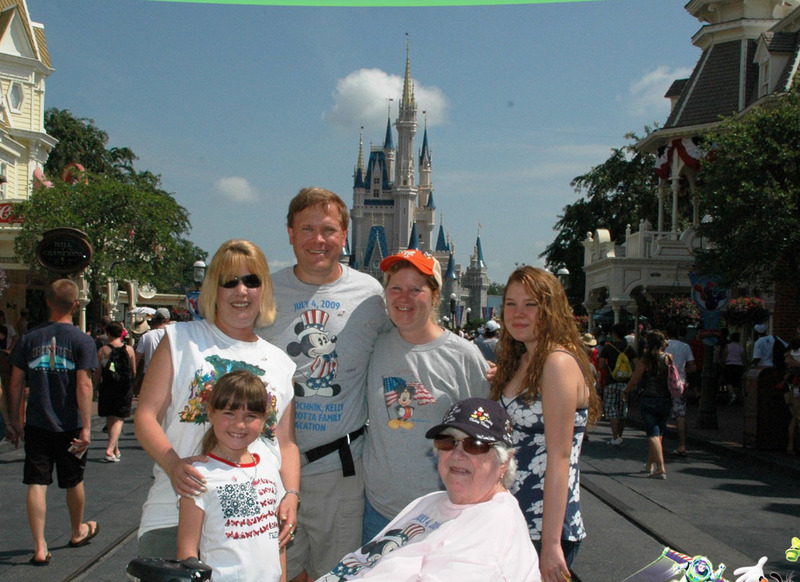 We arrived at Magic Kingdom and positioned ourselves at the foot of Main Street, in front of the flag pole. We had a wait so I went and got pineapple/vanilla ice cream dole whips. They were dripping by time I got back. Then Kelli visited the stores. We enjoyed the parade and then Wishes. The audio was excellent in this location and it made it one of the best viewings we've ever had. We were able to head out right way and had a short wait for the bus. We had breakfast at Pop Century's food court, and brought a few small last minute gifts. Our flight home was uneventful and we needed to rest before heading back to work the next morning. It was a good trip. Kelli and I did more than usual since we were playing tour guide. We were exhausted by the end of the vacation - the way I like it! This did mean we missed a couple of favorites like the Lion King, but there's always next year. I have to thank my sister Jeanette; we would not have gone if it wasn't for her invitation to join her in her time-share. It was great going with my nieces. Gabriella, Samantha and Amanda enjoy thrill rides and it gave me the opportunity to ride rides I haven't done in a while. It was great to experience Disney with little Samantha.